If you're looking for Colonial Style House plans, I wrote this page to help you decide whether or not this house plan style is right for you. So to set the scene we’ll go over some of the common features of the Colonial Style, then we’ll go on to discuss factors to consider if you’re thinking about going for this style. Today’s Colonial style house plans are one of the most popular styles and they retain lots of the original features along with a sense of ‘the American dream’ started all those years ago. Simple rectangular shape with a steep roof with gables perpendicular to the front door. The second story the same size as the first story. Breezeways and garages have been added to deal with sunny climates and today’s ‘car culture’. Often accommodation above the garage is incorporated to provide more living space. Is a Colonial style house plan suitable for your home? Flexibility – If you’re going to be true to the Colonial Style then the chimney has to be in the middle of the home and the windows a symmetrical design with a steep pitched roof. The chimney in the middle is the design element can make this style a little bit inflexible but the upside to the central chimney is that it’s a very efficient way of having a fireplace in several rooms. Lot Shape – Colonial Style homes are designed so that the ‘long’ side of the rectangle runs parallel to the road. There’s also windows in the gable ends so there needs to be room on all fours sides of the house for light to get into the home. Sloping Site – The style could be adapted much more easily if the slope is perpendicular to the main roof line – that’s generally from the front to the back of the house than if the slope went from across the front of the house. The saltbox idea of this style would almost lend itself to a slope going from the front to the back of the house. Scalability – Colonial style house plans generally range from 2,500 to 3000sqft. If you want something smaller the best idea is probably to move towards a Cape Cod style home. There are several options for making a colonial home larger. Most of the house plans on the market add space by adding another building, often a garage with accommodation above, with a breezeway to connect the two. Another way to increase the square footage would be to move away from a symmetrical arrangement and have another set of windows on one side of the front door. Remember though that this means any square footage added to the house plan is there on all of the floors so this method of increasing square footage leads to lots more space. Cost of Construction - The simple rectangular shape of colonial style homes mean that they are one of the best styles in terms of cost of construction. During the 1600s and 1700s people from all over Europe including England, Holland, Germany, Sweden and France were sailing the Atlantic and settling into the 13 colonies of what would become the United States of America. Each group brought with them their own architectural style and building know-how. Using materials they could get their hands on quickly, they built homes as best they could to shelter them from the new climate they found themselves living in. Faced with the cold winters of New England settlers had to build quickly to keep warm. This led them to build simple (quick to build) flat-walled, two story houses using timber (quicker than brick or stone) and they needed a fire (right in the middle of the house) to keep them warm. They were ready for the snow when it came – not a chance of it staying on those steep roofs. These first houses are called – (not very originally) ‘First Period English’. 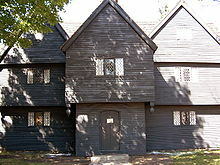 Corwin House built around 1660 in Salem, Massachusetts is very English in design with the diamond lattice windows. It wouldn’t look out of place in a crowded street in London at the time it was built (except that London had burned by that stage – ah well). Fairbanks House built in Dedham, Massachusetts. The central New England Colonial style part was built in 1641 and you can see the Dutch colonial style influence in the extension with the Dutch barn 'gambrel' roof line which was added in the 1700s. When there was time to make their homes bigger the settlers often built a lean to onto the back of their existing homes because it was the easiest thing to do to create more space. 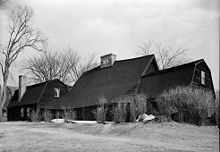 These are called Saltbox Houses because the interesting roof line resulting from the addition looked like a salt box. Comfort Starr House built around 1645 in Guildford, Connecticut is a good example of a Saltbox house. 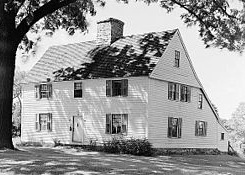 The Colonial building period lasted throughout the 1600s and into the 1700s in New York, New Hampshire, Massachusetts, Vermont and Connecticut. Strictly speaking a house built after this is not a colonial so the terms colonial revival or neo-colonial are used. Let’s just stick with Colonial shall we?